So I kind of snuck this idea in when I was posting about all the things they could do to easily make new content for the game. But I wanted to highlight it a bit. Mainly the idea of a non-clone Officer for the Republic, a gray-uniform Officer of the Republic Navy. That Officer could then have a by human face or alien face we've got available (probably barring Quarren). That could open up a LOT more variety and options, but having it only available at a high class level would keep it from taking over. The clone captain needs a helmet. The way you have them, I'd skip them all. Yeah, maybe you missed that part, but the armored clone officers without helmets was an effort at compromise between DICE wanting Officers to be distinguishable and letting them have some armor. I'd rather have full armor, too, but better to ask for a compromise and get it than demand everything and get nothing. But of course, we're now way off topic. 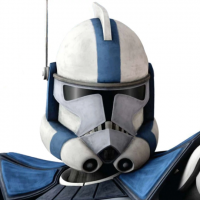 I was asking people thought of the option to have non-clone Republic Navy Officers available at Officer level 50+, so that you could play various different humans and non-humans leading clone troopers, for something a little different in a CW match. The point is, abundant and easy skin options that can be made by just recoloring and swapping existing skins. A Republic Navy Officer Option would instantly add, what, 20-30 skins to the game...? Seems worth it for minimal effort.